This is the only HH within this moveset. For my fellow collectors, this is the only snake pet with this move set to come in an H/H breed. This can be useful as Vek noted below. Search the hills for your best bet in catching this guy. After searching for about 5 minutes and not finding any I finally found one at coordinates (7,66) and got lucky enough to get a rare first chance with a poor king snake as a second pet joining the battle. Good luck pet hunting! Found a rare H/S at 67, 73, so rares do in fact exist. "THIS SNAKE IS OFTEN SEEN SUNNING ON THE EXPOSED ROCKS HIGH IN THE BADLANDS." - which is true. Found most of my King Snake's on the top of the mountains along the "scar." While "regular" Snakes/Adders might seem a bit bland some breeds are actually quite powerful in PvP. King Snake comes in useful H/H breed, 1644 health, which allows you more staying power and keep the powerboost from beast racial longer. Poison Fang keeps ticking, strong vs mechs. Hiss to mess with speed pets, lasts 4 turns. Finally Viscious Fang truly ramps up quickly with beast racial. Of course go with Burrow instead if you want avoidance. Im pretty certain these do NOT come in a rare version. I couldnt find any after trying for an entire day and night. Directly at server reset time there were tons all up in the cliff tops, however I've made 10 rounds non stop for the last 2 hours, I've killed at least 60 and NO rares anywhere. Of course 12 later I find a rare. I really thought they didnt exist. I was having trouble finding these as primary targets... so I just started clicking whatever I could in the Badlands and found rare one as secondary to a Gold Beetle between Dragon's Mouth and Agmond's End. A rare of this snake took me longer to get than my minfernal! 2 full days of rare hunting. finally got it as an add on to a gold beetle on the ground not on the cliffs where the kingsnake is the main pet. glad to be done with this one! :) good hunting! Stupid Naming Tip: For the ultimate bad Snakes on a Plane reference, name your King Snake Mother Foo (actually all things considered it's probably better if you don't). found quite a few uncommon ones on the cliffs but no rare. in badlands. The cliffs of the Badlands are the best place I found to get King Snakes. They appear high on the cliffs all around the edges of the zone and often spawn another king snake as a secondary. They can spawn as secondaries to the other pets of the zone but I would reccomend avoiding the stripe-tailed scorpids as they tend to spawn in pairs rather than with another type of pet. I found quite a few King Snakes south of Agmond's End as well. But the other comments are also right that they seem to come along as secondary pets in battles all over this zone. If you don't have any luck getting your rare around Angor Fortress or Agmond's End, just fly around the zone and battle any of the wild pets. 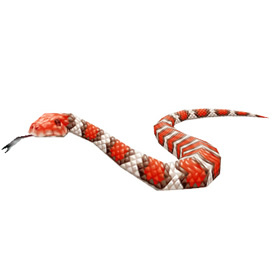 You may get lucky and get a rare King Snake as the secondary! Like the below comment said, they were at Angor Fortress but I found mine BEHIND the Fortress at 43, 19 area. There was two King Snakes at that location. Later on I found a few in the zone that tagged along with a Spiky Lizard, Gold Beetle and a Rattlesnake while rare hunting. 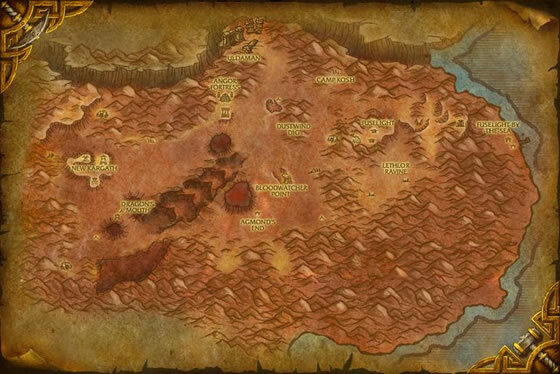 Edit: As I was going through the zone I noticed a lot of battle pets way on top of the mountain area, so if you do not see much down below, try higher up on the mountains! Loc 27, 25 found two more spawn points for King Snakes. Unlike many of the 'special zone pets', King Snakes can and will show up as secondary critters in pet battles in the zone. Therefore, if you are having trouble finding a King Snake, you may want to fight some of the others and see if one will join them. This snake is often seen sunning on the exposed rocks high in the Badlands.